Kate is a writer of fiction, narrative non-fiction and poetry. The Wurundjeri People of the Kulin Nations are the traditional owners of the land on which she writes and Kate pays abiding respect to their community and elders both past and present. Kate has an MD with Honours and a Diploma of Arts. She is currently writing a work of fiction set in the alpine wilderness of south-eastern Australia, supported by an Australia Council for the Arts grant. 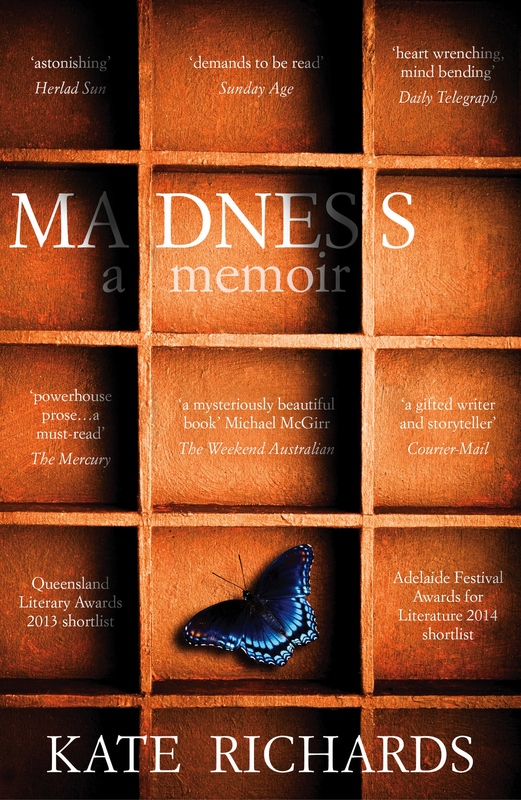 Madness: a memoir is published by Penguin Books Australia, available as an e-book and in print. It is the true story of a journey from chaos to balance, and limbo to meaning. Madness won the Adelaide Festival Awards for Literature Non-fiction Prize 2014 and the Nita B Kibble Awards – début author Dobbie Award 2014. It was short-listed for Biography of the Year, Australian Book Industry Awards 2014 and the University of Queensland Non-fiction Book Award 2013. The cover won Best Designed Non-Fiction Book 2014 at the Australian Book Design Awards for designer, Allison Colpoys. Publisher & editor: Andrea McNamara. Is there no place for me? is a literary essay published as part of the Penguin Specials series. It was short-listed for the Australian Human Rights Award for Literature, 2014.